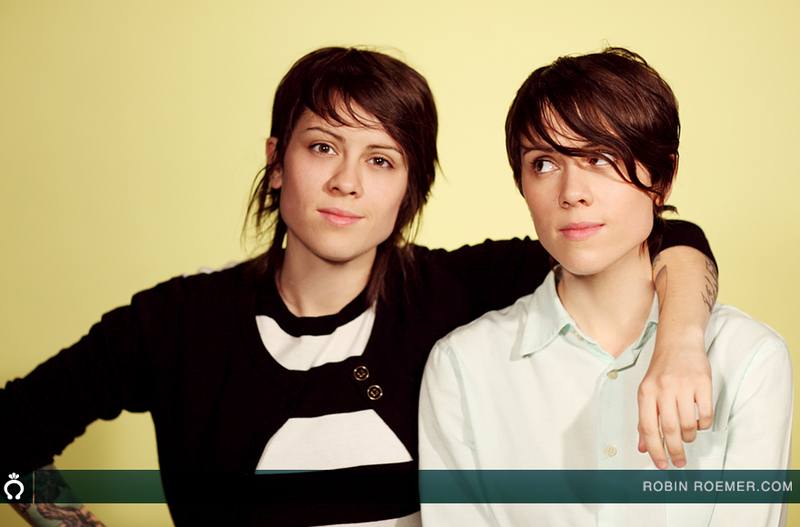 I really love Tegan and Sara. I love their music and I love their dynamic. 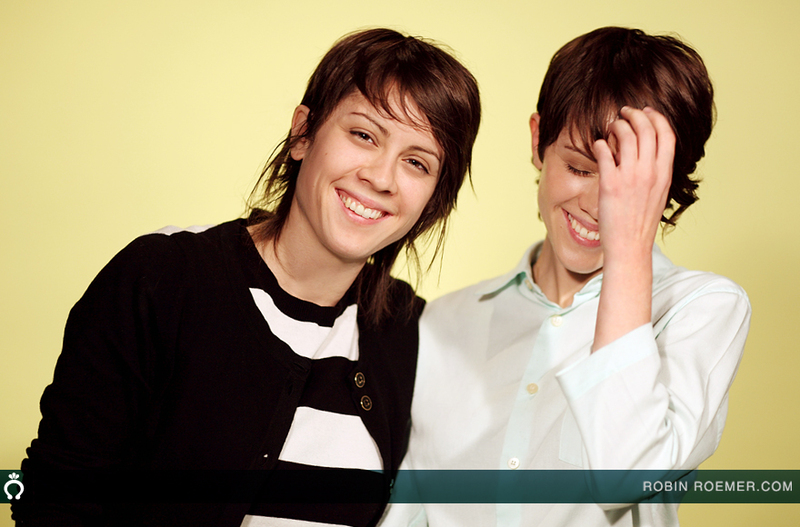 Tegan & Sara interviews are hilarious. Their banter on stage is not only part of their performances, it seems to be part of their everyday dynamic as sisters and a band. So when I was offered the chance to take some stills of Tegan and Sara, I snuck in to hear two interviews first. Did not disappoint. The last time I took pictures of these two it was 2007 and they had a large gap of time afterwards and said they were just going to go back to their hotel and relax. After they left, I kicked myself for not inviting them out but maybe it was my innate fear of being rejected by cute girls that stopped me. This year was a bit different. As their popularity grows, my time with them at MTV Studios shrunk to a 15 second time slot where I popped off a few shots of the twins against an already set up backdrop before they were whisked away for a series of interviews and shoots that took them from 9 in the morning into the evening. They’re such busy girls now, which is great for them! So that was my not-so-glamorous-but-still-completely-worth-it shoot Tegan and Sara experience of the year! I also said hi from all of us at Autostraddle because obvs we are big big fans and we LOVE their newest album, Sainthood. Perhaps we will get our very own private extensive glamorous photo shoot with them, but until then, here are a few stills from the interviews and from My Fifteen Second Shoot! 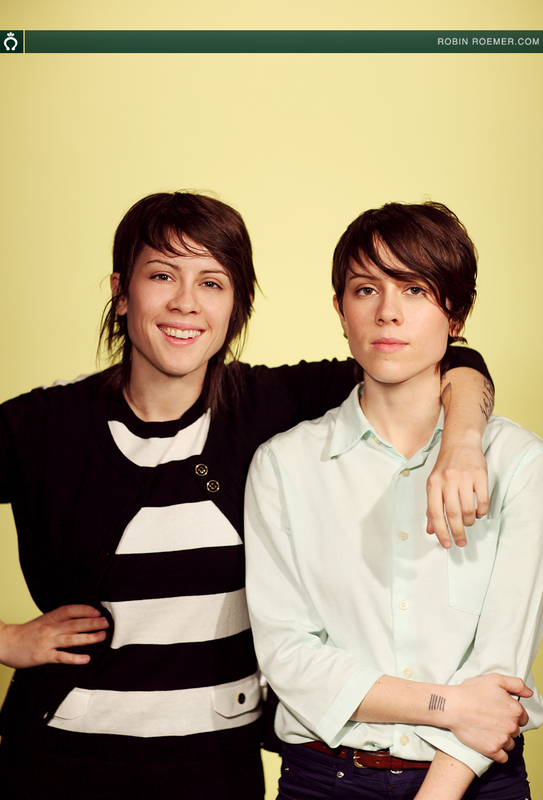 Tegan & Sara ‘Sainthood’ Winners Announced! I can’t take this much cuteness. I’m going to faint now. Goodnight. The first picture w/ the yellow background is one of the best pictures I’ve ever seen of them together. If adorable was a picture, that would be it. Yummy! Thanks so much Vanessa! I hope I can do an actual shoot with them soon, I have lots of ideas if I only had the time and resources. I mean, look at them. You really can’t go wrong. aaand i figured out how to log in. Robin, your work is stellar, as per ushe. Having T&S exclusive shots and interviews and etc etc on Riese’s site…now that is that way things are supposed to be. Good work, la-la-ladies. I couldn’t get such perfection if I had 15 minutes, or an hour! Just GREAT photos. I love the symmetry in the first picture. They’re such twins. your photography skills be ballin’, btw. Ahh my heart is exploding with cuteness! I LOVE your work Robin. I think you could make anybody or any thing look pretty. Not that you needed to with these girls. uhm. adorbs. that is all. these are ace! think you are a photog genius if you get these kind of photos from like 15 secs. Thought the one of them laughing was my fave, but realised i love them all! also the new autofocus page looks great! Thank you! I love the new page too! Riese and Alex are my heroes for building me my own little photo space on Autostraddle. Makes me want to go out and photo something right now!! Is it me or does Sara look a lot like Alyssa Milano in the second pic (where they’re laughing).